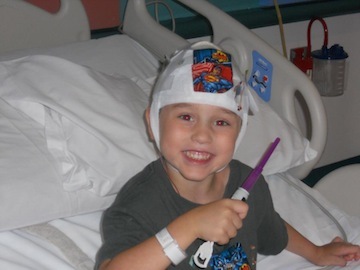 You may recall my post about five-year-old Jedi Warrior, Renn, who underwent a 72-hour Video EEG in hospital last week. In his honor, one of my writing colleagues, Marcie Colleen, declared it to be Renn Week on her blog. As part of that, she hosted a story pitch contest, in which entrants were to write a brief pitch or story about a child who had to face something difficult, and did it with the same qualities that Renn displayed throughout his experience. Renn himself would choose the winning pitch, the one that he wanted most to read. I duly wrote a little story/pitch and posted it in the comments on Marcie’s contest post. You can see it here. I am thrilled, honored, and humbled to be able to say that Renn chose my story! His mother tells me that it made him laugh over and over again, and gave them the gift of hearing his happy laughter. That, to me, is worth more than any prize could ever be. Thank you, Marcie, for Renn Week, and thank you Renn, for choosing my story. May the Force be with you! I so hope the doctors soon find medication and treatment that will ease Renn’s seizures. That lovely family remains in my thoughts. So very well done! Congratulations! Thanks, Rob-bear! The best part was bringing laughter to that amazing little boy. Okay. So now that I’ve wiped away my tears, I can say YAY for having your pitch selected. There is something so beautiful about a child’s laughter. Having your pitch spark it…that is priceless. Continued prayers for Renn.